Chandigarh, December 29, 2016: : Coming a long way and making it through 2016 surely calls for a celebration. It is that time of the year, when you look back and rejoice the best times of the year gone by. Nothing beats scrumptious cakes to celebrate and match up to the excitement. 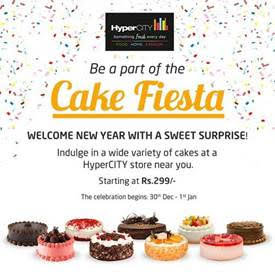 This New Year’s, HyperCITY presents “Cake Fiesta” to welcome better times and years ahead of us. Post the success of Cake Fiesta during the Independence Day weekend, HyperCITY is back with 300 cakes on display, on popular demand. “Cake Fiesta” will mark the celebration of New Year’s at HyperCITY with a display of wide variety of cakes, across mouth-watering flavours such as German Black Forest, Red Velvet, Mocha, Black Forest and a lot more exotic cake flavours. The three-day offering will be for customers to indulge in best quality cakes starting at Rs.299 only per half kg. Making the year-end merrier for everyone across the country, the celebrations begin on 30th December, 2016 till 1st January, 2017at the HyperCITY store. HyperCITY - • Malad: Next to Inorbit Mall. • Vashi: Inorbit Mall. • Thane: Big Shopping Centre & Viviana Mall. • Panvel: Orion Mall. • ITPL Road: Near Kundanlahalli Gate • Whitefield: Inorbit Mall • Bannerghatta: Royal Meenakshi Mall. • Brigade Gateway: Orion Mall • Madhapur: Inorbit Mall. • Kukatpally: Manjeera Mall. • Pune: Kumar Pacific Mall. • Janakpuri: Unity One. • Noida: Gardens Galleria Mall & Logix City Centre. Ahmedabad: AlphaOne Mall. • Vadodara: Inorbit Mall. • Amritsar: AlphaOne Mall. • Bhopal: DB CITY Mall. Welcome the New Year with a Sweet Surprise!